In waiting for a wave, in sitting out there between sets, bad thoughts, obsessive thoughts, will surface, but while actually riding, while standing up and searching for that rhythm, no matter how awful the day I'm having, my mind is clean and clear and blank and therefore content. I have never, not ever, had a conscious thought, good, bad or indifferent, while in the act of riding a wave. Some days I really need that vacuum, that purity. Greg Long bringing the drawings in our school books to life at Dungeons, SA. XXL winner 2006/7. 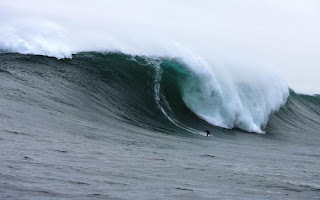 Great Blog, this "Monday Morning Wave" really touched my deep thoughts today... It is always good to think about our time and what we do with each moment of it. Thanks for the great Blog!